2011 was a very busy year, but I didn't want to break with tradition after three Christmas-themed open houses in a row. Also, I do these in conjunction with an open railroad tour that is scheduled for the week after the Dayton (Ohio) Train Show. I always like to give folks who've been watching teensy little trains in crowded basement a chance to see big trains running outside, November weather permitting. Most years, the weather's been great, though a couple of times it's gotten cold and windy at dusk, just when the lights are at their best. 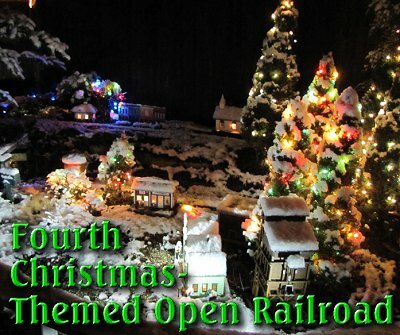 Several weeks before the Dayton Train Show I contacted the guy in charge of scheduling the open railroads and asked him if any other garden railroaders would be open. If one of the bigger, nicer railroads was going to be open, I'd be willing to leave mine shut down and help the other railroaders. But no other garden railroads were signed up, so I started working in earnest, since we'd be representing the garden railroading hobby once again. Last year, we had our open railroad on the Sunday after the train show, but this year we were going to be helping with a kids' outreach program at our church on Sunday. So I e-mailed the guy in charge of scheduling the open railroads and told him I would be open on Saturday Nov. 12, NOT Sunday, Nov. 13. We posted the date on Facebook and on our web pages and in our newsletters and notified the other members of the local Garden Railway club. In addition, my grown daughter who always comes home to help invited her friends who had kids. Of course, I'd been doing preparations all along. The weed problem is less than it used to be, since I poured concrete under about thirty feet of the ROW last year, but the ties in my "lower loop" had hit the point where they need to be replaced. 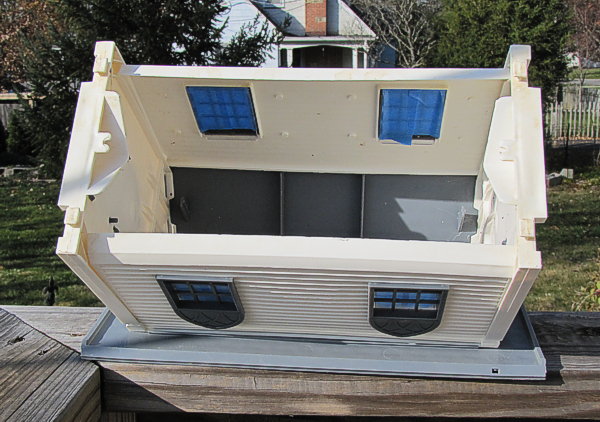 (Ten years of direct sunlight takes its toll on black plastic, even when it starts out UV-resistant.) AristoCraft had given me new tie strips under warranty, so that's not a problem except for the time it would take me to replace the ties. So I "borrowed" some of the track that I've been using on public display railroads, and put that down instead of fixing the track that was down. (Now I have a nice winter project, too.) While I was doing that, I shortened the lower loop by about four feet - the fir tree that used to grace one end of the loop is now about ten feet across, and I was tired of crawling under the lower branches to knock needles and sap off the track. I laid the replacement track, then got some Grani-Grit chicken grit to use as ballast. Once I got the track level and ballasted, I ran a short train around it to make certain it was ready to go. As an aside, a week before the Dayton Train Show, I still hadn't heard back from the guy in charge of scheduling the open railroads, so I contacted him again to make certain he had us down for Saturday, not Sunday. He said he hadn't gotten my other e-mail and had us down for Sunday. Plus he'd just sent the file off to the guy who was going to print up the fliers. An hour later he called back and said he had got it straightened out - turned out there was another mistake, and they figured it was worth taking the time to fix them both. Whew! That was a close one. I was so pleased with the effect of the LED spotlights last year, that I had considered installing them permanently this past summer. But, again, I had other responsibilities, and when fall came, most of the lights were still uninstalled. Two of the 12-volt power supplies that had come with the sets were bad, but one was still good, so I hooked it up and set the spotlights out in a temporary arrangement, as I had last year. 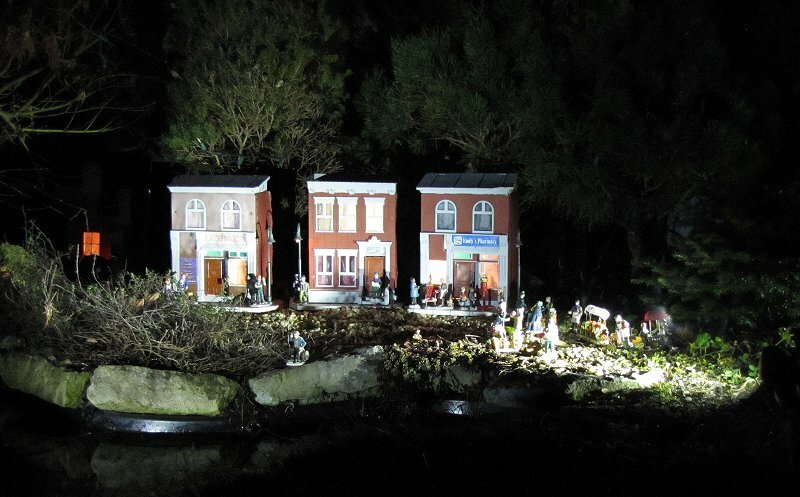 This year, though I had a few more lights, so I was able to better light some of my towns. By now it was obvious that both towns that used to be near the fir tree that bisects the railroad needed to be moved few feet further from the trunk. So I compensated when I set out the lights. Once I had the buildings in place, the result was very nice. A number of my buildings have 12-volt sockets screwed right to the walls, from one of my earlier lighting projects. Some of them have lampposts fastened to the base and wired to the same wires that serve the 12-volt sockets. For those buildings, I used the Malibu connectors to get power from the main "Malibu" 16-gauge two-conductor black cable, but I stripped the other ends and used twist-on connectors to hook to the building leads. Those that don't have sockets wired in were treated to the attach-a-bulb-on-wires-to-the-Malibu-cable-and-set-a-house-on-it treatment. I moved the bulb around inside so you couldn't see it through the windows, but I didn't bother attaching the big glowing dispersal unit like I did the last two years. My youngest, Molly, still thought that one of the stations looked like it was on fire and eventually populated the platform with Lemax firemen. One building I didn't light last year deserved lighting - a plastic Northern States bird feeder shaped like a church. I masked the windows on the inside, spray-paintd the inside keep the building from glowing like it was radioactive, then took off the tape. You can somewhat see the result in the title picture. When it got too dark to work on track, I could usually depend on another half hour or so of usable time to hang the lights on the trees. If you have any kind of sensitivity to flashing lights, though, I don't recommend hanging LED strands in near darkness. They strobe like flourescent lights do, and create the most interesting "trails." Then again, you might like it . . . . The row of arborvitae that makes a backdrop for my railroad have all gained about two feet since last year, so the 35-light deep blue strands I used last year wouldn't do. In fact, I tried a 50 light strand and thought it wasn't quite enough. So most of the arborvitae received a 60 light strand. By the way, don't believe everything they say on the LED light packages about them lasting virtually forever. LED strands requires a separate circuit that conditions the electricity to drive the LEDS. They look like little cylinders between the plug and the first light. When you get to the 50 light strands and up, there are two of those little circuits. Now here's the fun part: Several of the 50+ light strands that I bought last year had one or the other circuit out, so only half the strand lit. I used them anyway - there are a few places where I needed to get electricity between one stand of little trees and another without necessarily wanting a string of lights glowing in between. But if you buy a big strand of LED Christmas lights thinking they will be with you forever, think again. Also, I wanted the tiny little "dome" lights on my arborvitae like I had last year, but this year, those strands had fewer lights. So I used tiny little "globe" lights. Almost none of the blue LED lights I bought this year had the same rich cobalt blue I was used to from last year. In fact some approached "sky blue" in color. But on the trees, you hardly noticed the color variations. I used some incandescents on part of the northern loop of my railroad, but the rest of the trees received LEDs. The photo to the right shows the northern loop. 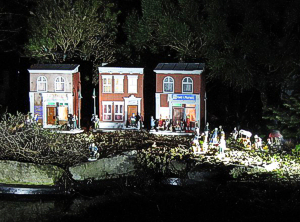 The lights on the left side of the photo are LEDs; the lights on the right are old-fashioned incandescents. As I have been doing, I used mulicolor strands on most of the trees that were ON the railroad, and just blue on those that were part of the "backdrop." The last big photo on the page should give you some idea. I have to admit it's a bit more challenge to set out, light, and populate four or five communities outside than it is to set out your Dept. 56 buildings and accessories inside. 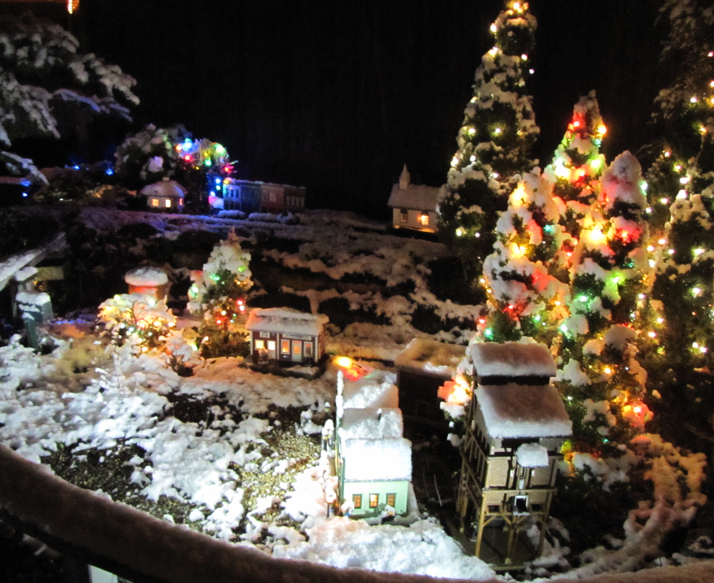 But it's so much more fun to see outdoor communities come alive surrounded by lit live evergreens and trains running every which way around them. 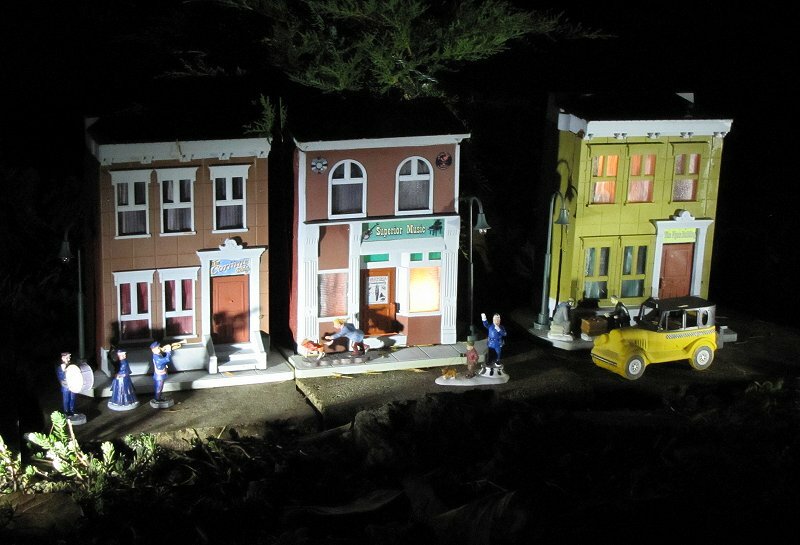 When I wired up the buildings' lighting, and tested it, a couple of the buildings would not light no matter what I did. So I left them for now - most of the visitors come during the day anyway, and all of those buildings will need work soon. Besides, with the floodlights on, the buildings would be lit from outside as well as inside. I also assembled the 4x14' elevated loop that I've been setting up to put Thomas or James on at least once a year since 2007. I usually put a rope light around that railroad, but this year it was too cold to install one. (The viny brackets that come with them self-destruct in cold weather.) So I attached a strand of white "crystal" LED lights to one side. 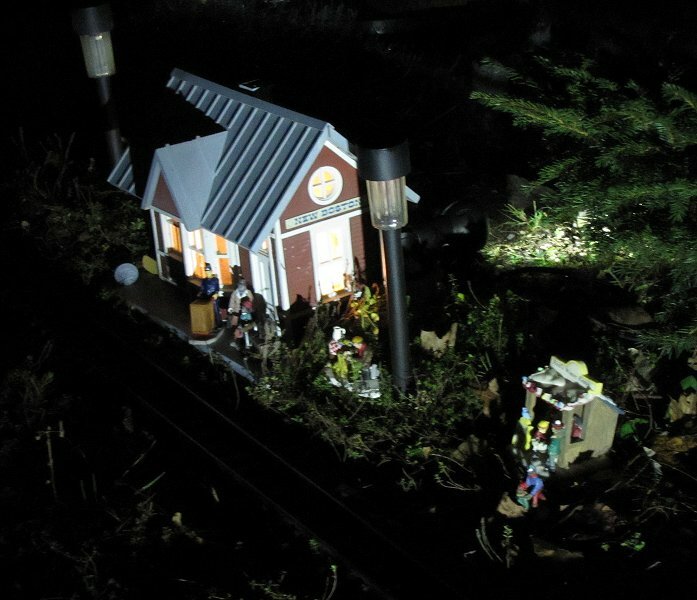 The good thing about this was that, since about half the lights stuck up above the roadbed, it was easier to see Thomas after dark than it had been with rope lighting. A bit down this page, you can see a photo of a young visitor chasing Thomas on this railroad in the daylight. When Molly (my college-student youngest daughter) came home, she helped by arranging lots of people on the sidewalks and near the buildings. She also set out animals on the farm. In other preparations, we bought plenty of popcorn and oil for the popcorn popper (we have popcorn salt on hand due to buying a big jar of it years ago). Molly and I made train-shaped cookies. I also bought lots of batteries for the battery-powered trains we were going to use. When the "big day" (Saturday) came, Shelia made lemonade, iced tea, and spiced cider. My oldest daughter Kristen arrived with her husband to help, and she made a very large pot of coffee. My son-in-law Steve helped me set up one of the battery-powered trains, a Lionel Polar Express that is closer to O scale but runs on 45mm ("G gauge") track. We set it up, along with a few buildings, on the wellcover near our back door. Molly, my youngest daughter, set up our ancient PlaySkool train on the back porch. This is the best working train ever made for toddlers, but it's been discontinued (except for one small run) for nearly thirty years. Not only is it sturdy enough to withstand toddler handling, but it turns on and off simply by pushing the yellow button on the smokestack. This year, the locomotive was a little contankerous - I wonder if the switch is getting corroded after all these years. But once we took out the batteries and reinserted them, it ran fine. I brought out some small houses that don't really go with my trains (or hold up outside), but work fine on a kids' railroad on a sunny day. I also set some building front "flats" that I made with "road spam" and weatherproof labels around Thomas' railroad. In years past, I've used real buildings, but buildings around the Thomas RR have been known to take a beating from tiny feet. To learn how we made these storefront "flats," please click here. We had a good gathering on Saturday, although ALL of the people who came to our scheduled open railroad were family and friends. The first batch included high school and college friends of my oldest daughter, as well as their children. 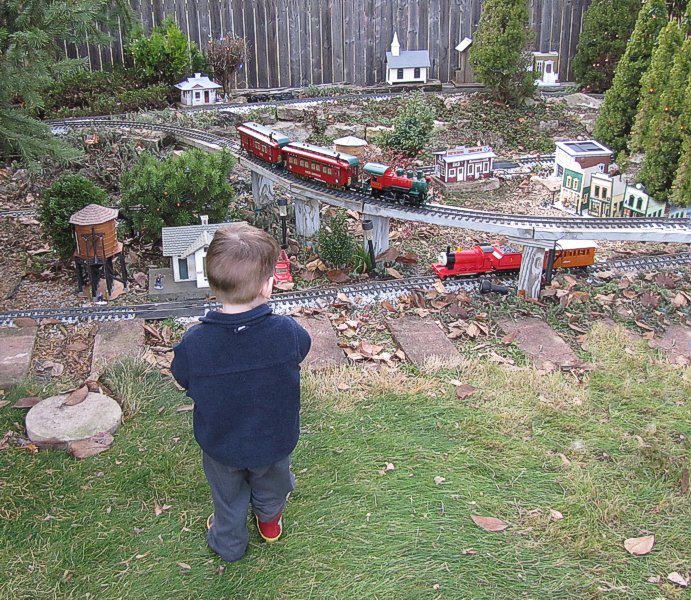 All of the youngsters liked watching the trains and spent some time going back and forth among the "big" railroad and the three temporary railroads. 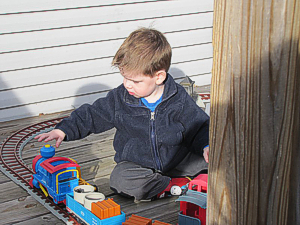 Eventually, though, most of the kids gravitated towards trains they could run . After figuring out the Playskool and playing with it for a half hour or more, the kids over 2 1/2 each found their way to the Lionel and its remote control. Once the kids figured that out, it rapidly became the favorite. 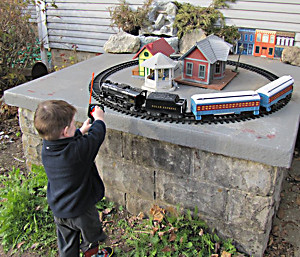 When I reviewed the Lionel "G gauge" battery trains last year, I wasn't necessarily thinking about very small children, but they caught on fast and stayed busy with the train for a very long time. One of the young men was so fascinated by the Lionel remote control that he took it over to the permanent railroad see if it would control the electric trains running there. After a minute or so of pushing the buttons very hard, he gave up and went back to the Lionel set. Most of the adult visitors took the time to watch the trains on the big railroad and ask questions, which we were only too glad to answer. Most expressed appreciation and complimented the trains, the lights, the music, the buildings, the treats, or all of the above. Several of the adults expressed an interest in setting up trains outside one day, and of course, I showed them examples and answered questions at lenth. I also told them about the Miami Valley Garden Railway Society and FamilyGardenTrains.com. Visitors came and went, including friends from church, friends from the community, and one couple from the Cincinnati Garden Railroad club who brought more snacks. Thanks for coming up, guys. Sadly, the kids all had to leave before it got dark enough to really appreciate the lights - a problem with cold-weather open houses. But we had a steady stream of visitors up until about 5:15. Then my oldest daughter and her husband took their leave. Just as it turned dark, a friend who has N gauge trains in his basement came over and we had time to visit and watch trains for a few minutes. At 6:00, I took down the sign, and we started taking in the snacks and the trains. Shelia and Molly were going to a play at the high school, so I figured I would have time to go with them if I hurried. I unplugged most of the lights that you can see from the street, and jumped into the car. We saw a Tecumseh High School production of "Arsenic and Old Lace," which was very entertaining - our district has always been a great incubator for talent. Afterward, we settled down for a long winter's nap. Thinking over the day's activities that night, I realized something - not ONE visitor had come as a result of seeing the open railroad schedule that the Dayton Train Show had published. I had a sneaking suspicion that the date never was changed, and the schedules that went out still had Sunday, not Saturday for the day of our open railroad. On Sunday morning, Shelia needed help setting up some things at church for the children's program. But I wasn't much help. Just when it was time for us to go over, a couple we've never seen came down the driveway to see our railroad. OOOPS. It turned out that our open railroad WAS scheduled for Sunday, according to the handouts at the train show. Shelia had to leave for church by herself. I got trains out to put on the permanent railroad, and turned on the music, but I thought I'd wait to put the kids' trains out until I saw if any small children arrived. The first couple that came actually have a garden railroad but were glad to see ours. Long before they were satisfied looking around and asking questions, another couple came. Still no children. I put the sign out late and hoped that I hadn't scared off anyone else by not having the sign out "on time." I brought out the cookies and offered lemonade and cider. We had several more visitors as the day wore on, all without small children (go figure), so I had no trouble manning the railroad by myself and keeping up with questions. One of the ladies found a chair about thirty feet away from the big railroad and sat there. I asked if I could get her anything, but she just said she liked being where she could take in the whole thing. Again, I answered lots of questions, gave lots of advice, and pointed lots of folks to the Miami Valley Garden Railway Society and FamilyGardenTrains.com. I knew Shelia would need help packing up things at church by six o'clock. So about 5:30, when the last couple left, I wrote out a note apologizing for shutting down early and offering cookies as a condolence, unplugged everything, and went to help Shelia and the rest of the folks at church clean up after the kids' outreach. No one had taken any cookies by the time we got back, so we must not have missed any late visitors. That night Shelia and I slept VERY WELL. The next day, Shelia told me that one of the church families who came last year, remembered about our open house when it was too late to come. 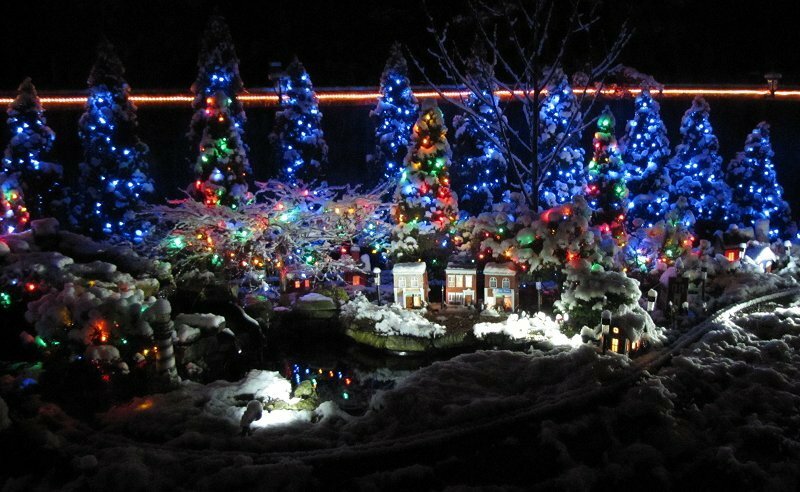 Shelia told them not to worry, that I'd be leaving the lights up until Christmas at least, so they might have a chance to see the trains later. Since then, we've had the same conversation with a few other folks, so we may be having another, albeit smaller, event between now and Christmas. If you are scheduling an open house, be proactive about the schedule. If the person doing the schedule won't get back to you to verify that he or she has it right, keep calling and e-mailing until he or she does. Once it's printed, demand to see a copy no matter what folks tell you it says. Stay on top of communications. There were several other communications breakdowns that I won't bother to relate, but we probably would have had several more families if everyone who promised to get the word out in local hobby web sites and newsletters had done so. Have kid's activities - most of the parents of small children appreciated the "break" that came when the kids played intently with the kids' trains for a half hour or so at the time. I have at least one more battery-powered train I'll try to set up next year, maybe two or three, depending on how my old battery-powered Bachmann Big Haulers are holding up. Have help with the kids. My daughters were very helpful in keeping an eye on the little ones. Don't feel bad if everything on your list doesn't get done. Just prioritize so the most important preparations are made, like the trains run. Every year I promise myself we'll be more prepared, and every year our helpers are working right up to the last minute to get things ready. But we have been able to build on what we've learned (and even built) in previous years. This year, for instance, the battery-powered Lionel toy train took over the place where the Bachmann On30 had circled ceramic buildings the previous year. No one seemed to miss the ceramic buildings, and the Lionel's remote control was the hit of the show, for the 3-year-olds, at least. A few days after the open house, we got an early, light snow - not enough to keep me from running out with the camera. Too bad we can't figure out how to have snow on the railroad and pleasant temperatures at the same time. Above all I'd like to thank Shelia, Kristen, Molly, and Steve for all their help. 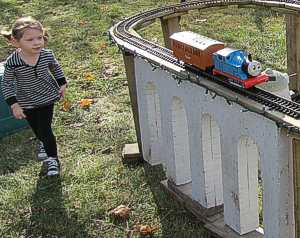 Fortunately my family sees our open railroad as a family activity and not just "something Dad does." And, through the power of the Intenet, we get to share the fun of this day with literally thousands of people who couldn't have been here if they tried. Hopefully, seeing this article has given you some ideas, some inspiration, or at least some Christmas cheer. 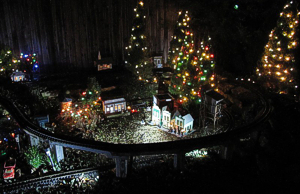 The story of 2010's Christmas-Themed open railroad is published here.